Features: Instantly Turn Any Pocket Into a Powerful Cell Phone Radiation Shield., Blocks up to 99% of cell phone EMF radiation away from your body and reproductive organs. A super simple way to protect yourself from harmful cell phone EMF radiation. Our patent pending technology shields from wireless radiation on one side only so you can shield your body from harmful EMF without interfering with phone reception, function or battery life., Each Pocket Patch is 6.25″ x 4″ and is super simple to apply: just stick the patch on your pocket where you carry your phone. It’s super thin, so you won’t even know it’s there. Works on any pocket (jeans, pants, slacks, skirts, shorts, shirts, jackets, etc.). The adhesive is strong and permanent, so you don’t have to worry about the Patch coming off your pocket., Don’t be fooled by EMF pendants or charms that claim to harmonize or neutralize EMF radiation without any scientific proof. Our Pocket Patch uses universally-accepted and scientifically verified principles to shield your body from EMF radiation, and testing at UCLA shows our Pocket Patch deflects up to 99% of cell phone radiation. Inside each Patch is a super fine mesh of silver fibers that form a shield to block EMF radiation., High quality, comfortable, hypoallergenic cotton, lined with gossamer-thin silver thread. Machine washable. Made in USA. Patent Pending. 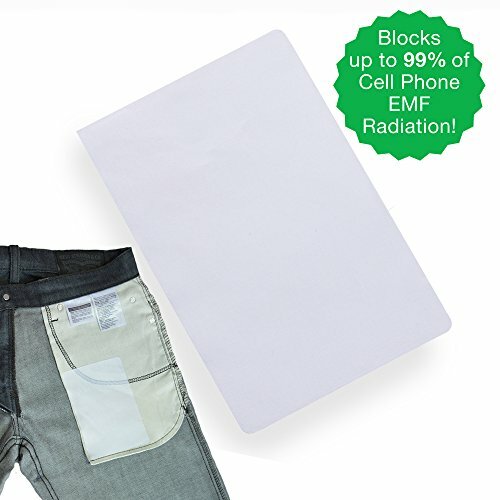 Check out the entire line of simple and powerful EMF protection products from Shield Your Body, like our SYB Phone Pouch, SYB Laptop Pad and SYB Baby Blanket. The SYB Pocket Patch makes it super simple to turn any pocket into a powerful cell phone radiation shield. Just stick the Pocket Patch on any pocket to deflect cell phone radiation away from your body. The Pocket Patch works on any pocket, including pants, jeans, jackets, shirts, suits and skirts. The Pocket Patch doesn’t block your cell signal and it doesn’t drain your battery. The Pocket Patch just deflects harmful radiation away from your sensitive bits. Testing at UCLA’s Center for High Frequency Electronics shows that the Pocket Patch deflects up to 99% of cell phone radiation. Our Pocket Patches use well established, proven science. Woven into each Patch is gossamer thin metallic thread to form an EMF shield. Each Pocket Patch is 6.25″ tall and 4″ wide, and each package comes with two Pocket Patches.